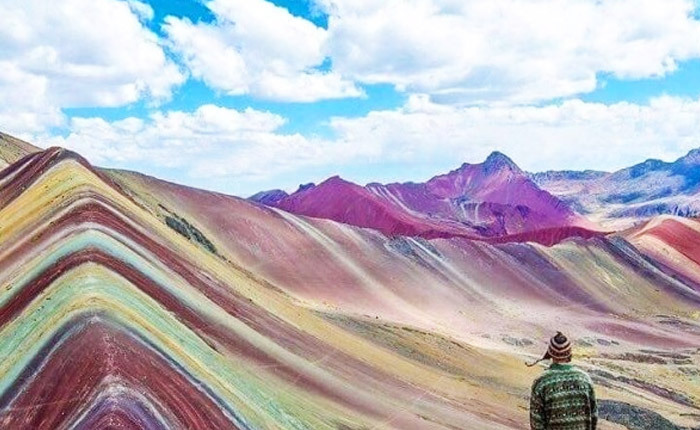 For the past months the exposure of Cerro Vinicunca, or Rainbow Mountain, on travel blogs, forums, and social media has added a new destination to the ‘Must-See’ list of travelers around the world. 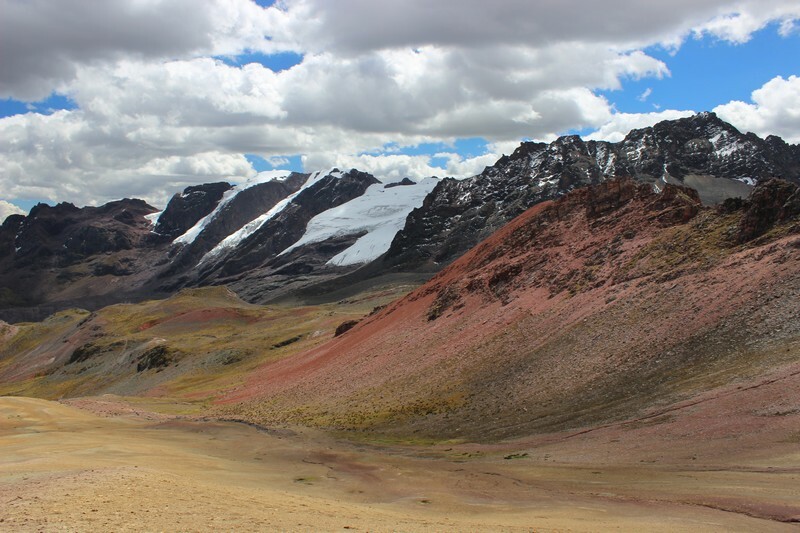 For years, Rainbow Mountain was only explored by locals and trekkers completing the 5-day hike to the Apu Ausangate Glacier- Cusco’s largest mountain (20,945 ft. above sea level). Most of the travel community in Peru hadn’t even heard of this magical mountain until a couple years back. Now it can be explored as a full-day excursion or 2-day overnight adventure, making it much more frequently explored. Vinicunca, quechua for ‘Mountain of 7 colors’, is a perched mountain range decorated with colorful layers of rock sediment. The colors flawlessly run down both sides of the summit as if painted with a brush. 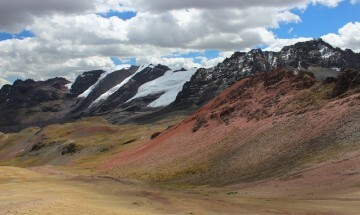 As you look off to one side of the summit, you find a deep valley of rolling hills covered in deep reds and greens. 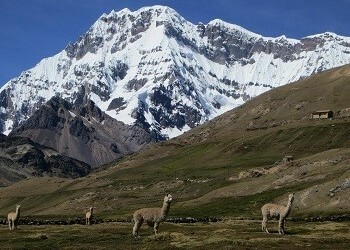 As you look to the other side, you find the massive Apu Ausangate towering over. 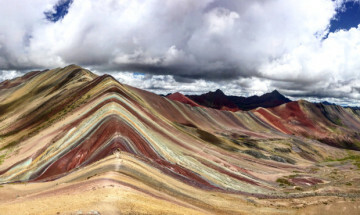 Rainbow Mountain sits straight ahead striped in deep reds, golden yellows, turquois and orange. 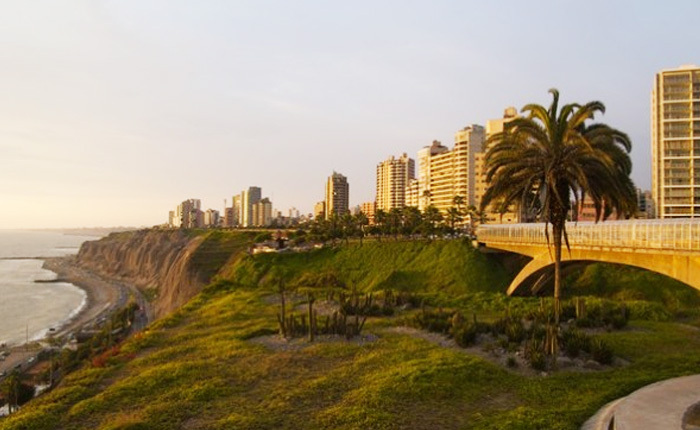 This fairy-tale scene is any adventure-seekers dream of exploring a gem “off the beaten path”. The 4 am pick-up doesn’t quite equate to “vacation-mode”, but the early wake-up definitely pays off to experience the sun rise through the Andes mountain range. The serenity of driving through these sacred lands while the world is still asleep ads to the mystique. We’ll head southeast from Cusco gradually increasing in altitude until we reach the town of Hanchaipacha, at 14,100 ft. above sea level. Along the way, we’re greeted by herds of alpaca and llamas. 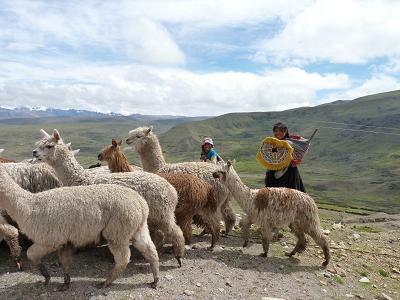 The Ausangate community of Cusco is one of the only few shepherding communities left in the world. 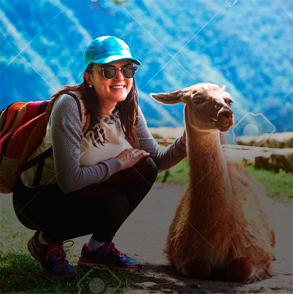 They raise llama and alpaca following their ancestral tradition and use the animals to endure their harsh climate. A note on the climate – the air is thin and brisk at 14,000 + ft., so coming prepared with thermals and proper gear is a must. In Hanchaipacha breakfast will be prepared by our guides and crew and we’ll start our ascent towards the magical Rainbow Mountain. 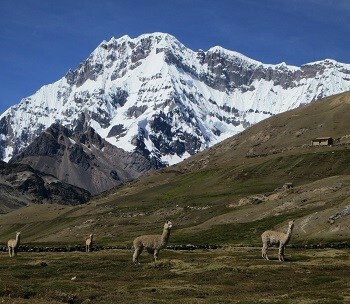 Throughout this trek we’re delighted again with dream-like scenery – alpaca herds, rural villages, and a snow-capped mountains. The first-hand experience of walking through rural villages, unadapted to any of our modern ways, is one of the more precious moments on the trek. 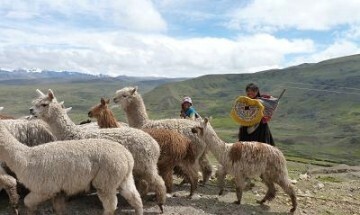 The villagers speak Quechua and translation is offered by our guides as we greet each other. The people, cheeks chapped and skin adapted by the brutal climate, bring perspective to the different realities we’re given in life. The cold air runs through the hillside and valley as we reach the K’airahuiri valley, at 14,800 ft. From this point, we’re faced with a more challenging hike as the incline steepens and altitude increase makes each breath more difficult. To complete this steep ascent it will take courage, mental strength, and a couple stops to catch your breath along the way. 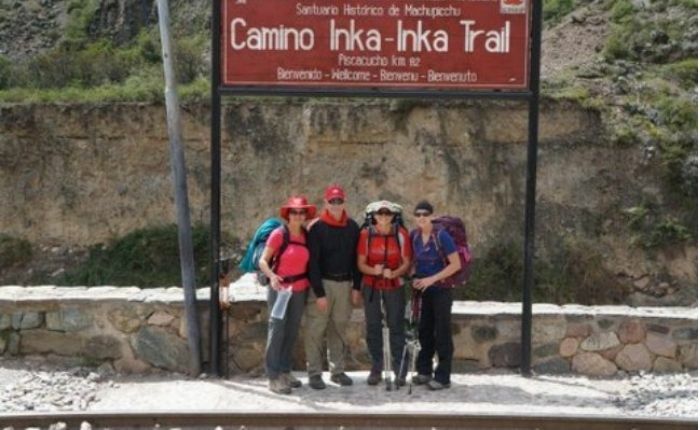 Our expert guides work with each individual to make sure their pace and trekking needs are met. Finally, as we struggle to reach the final pass, we’re greeted with a hillside covered in color, like nothing any of us have ever seen before. The struggle to get here was real, but more than worth it! I’d love to hear your experiences getting to the Rainbow Mountain. 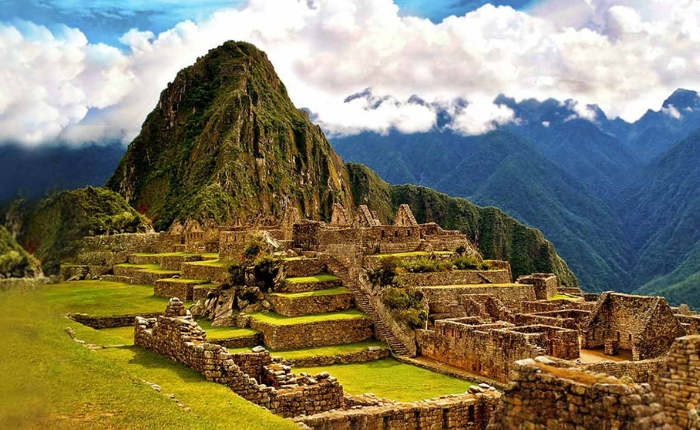 If you’re interested in partaking in this experience, take a look at our Rainbow Mountain & Machu Picchu program or contact an Inka Experience Travel Specialists at sales@inkaexperience.com. 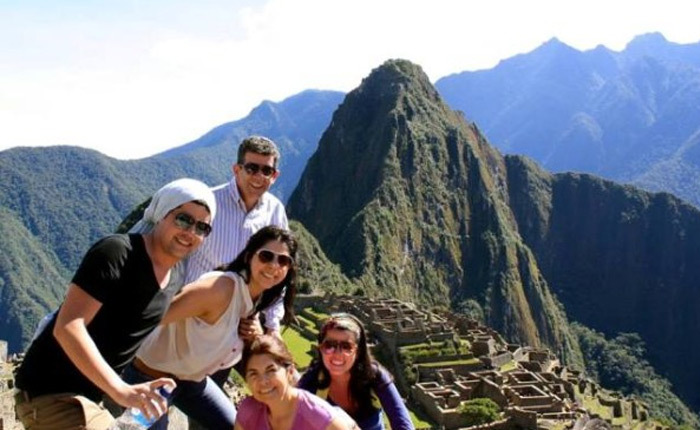 You can also reach one of Inka Experience’s travel specialists at their US toll-free number: 1-800-260-4681. 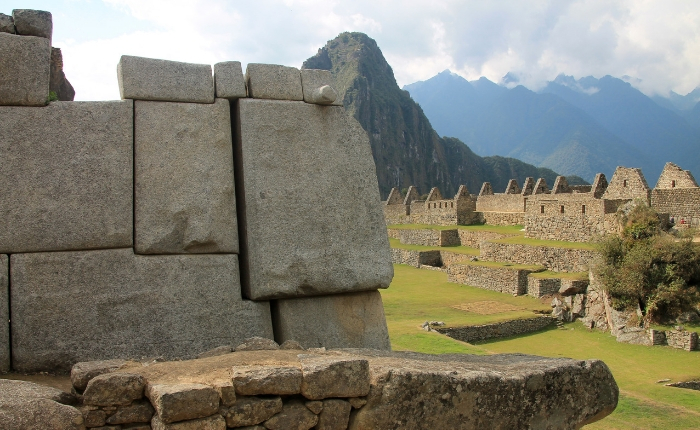 For more info on Inka Experience and other Peru travel packages, head to www.inkaexperience.com.